Isn’t that a cool picture? 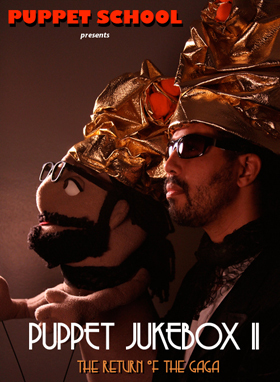 Last May, we did a puppet show called Puppet Jukebox. And now, we are bringing it back for another weekend of performances. So here it is, the sequel: Puppet Jukebox II: The Return of The Gaga. It will be the same format. We are going to walk you through the history of music in the last century. We have a mix of people who have performed in the first one, such as myself, and a new group of graduates performing together. We have a mix of songs from the previous show and some new numbers. The theater is better, and the stuff we are doing is more ambitious. And it’s going to be fun. WOW. I wish I come and see this show. I will be there in spirit. The video of the song from last year’s performance was WONDERFUL. I felt like getting up and dancing, but watching the puppets and their human counterparts singing and dancing kept me riveted to my seat. That’s a great song. Have a good holiday time. p.s. The name of the show made me laugh. I really enjoy watching this video too. Love the video! What fun. If I were nearby I’d definitely come to see the show! Thanks, Marie. I am always happy to see you!